Are you working to ditch processed foods and put more real food on the table? This month we’re continuing a series called Real Food Made Simple: A Beginner’s Guide to Eating Better. Our goal is to answer the questions you might have and make the transition a whole lot easier! I was a starry-eyed young bride at the tender age of nineteen, and the day we unpacked cardboard boxes in our wee bachelor suite I was in my glory. My newly minted husband and I made innumerable messes in the kitchen as we baked and stirred and experimented together, finding our groove together. I applied my modest kitchen skills with gusto. I used to pore over cookbooks (these days I just take my laptop into the kitchen with me) and try new things at pretty well every meal. The years ran away from us, as they tend to do, and here we find ourselves a decade into the future with a trio of cute kiddos and a minivan, still chopping and sizzling away in the kitchen. One of the classics that I learned early in my adulthood that I still absolutely love to make is a simple roasted chicken. Some people find the idea of roasting a chicken quite intimidating. I actually think it’s one of the easiest things you can do. With a little bit of knowledge anyone can make a roast chicken dinner that is delicious and impressive, worthy of your coziest of Sunday dinner tables. Classic comfort food at its finest. What Kind of Chicken Should I Choose? Free-range chickens that peck around eating dirt and bugs are best. That’s what they were designed to do, which results in a healthier bird and better nutritional content. Organic is always good too, of course. To be honest, my personal preference (if I had to choose just one) would be for free-range over organic, but that’s just me. Other important considerations are what kind of feed is used to supplement the diet, whether they are given antibiotics, and how much space they are given to roam (hint: the grocery store version of so-called “free-range” is not what you think!). The best way to be confident in your choice is to talk to your meat supplier and ask questions. Try to find a small, local farmer who cares. When you buy a whole chicken, it will generally come wrapped in plastic. Unwrap it, and if there are giblets inside, remove them. You can leave them in the pan if you want to – they add flavor to the gravy. Place the chicken in a roasting pan and add water. I use a pan just bigger than the chicken, and I add about an inch of water. The chicken drippings will add to this as it cooks, which will be the base of your gravy. No need for store-bought broth or bouillon! At this point you can do whatever “extras” you want. Some people like to rub butter under the skin and throw a lemon into the body cavity; some like to just sprinkle a little salt and pepper. I like to add liberal doses of real sea salt and fresh ground pepper, with a nice sprinkling of dried rosemary. I love the subtle rosemary flavor that ends up in my gravy too. There are a bajillion different options for flavoring here – experiment to find your favorite! You may also want to add potatoes and veggies into the pan for baking in the juices, but be aware that you will have way less liquid for gravy-making. Place the covered pan in the oven for the designated amount of time according to the chart below. Be sure to check your temperature with a meat thermometer. Stick it in the fleshy part, and only partway through. 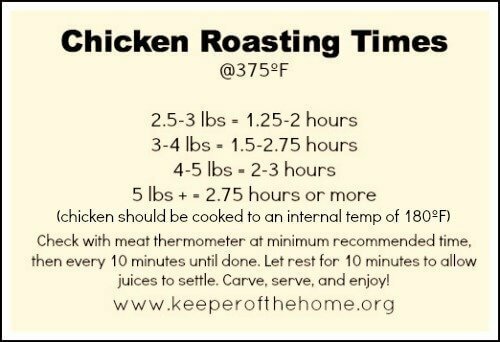 You can also check for doneness by poking near the drumsticks, and if the juices run clear it’s done or nearly done (check the temperature too). The chicken may be the star of the show in a roast chicken dinner, but I happen to love the side dishes even more. I was always the kid that took seconds on veggies and declined dessert. Three pregnancies later and I have a bit of a sweet tooth problem, but I do still love my veggies! And for a simple but decadent, make-ahead dessert treat, try this chocolate coconut macaroons recipe. Not a single unhealthy ingredient in them, and dang, do they ever taste good! 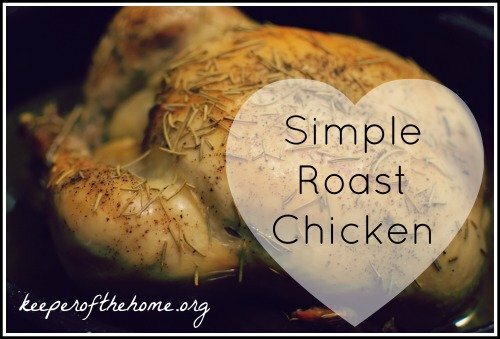 When did you roast your first chicken? What’s your favorite flavor option? What sides do you serve with roast chicken? do you put the chicken directly in the water or on a grill? Hi Steph, I place it directly in the roasting pan, right in the water. I’m sure a grill would work too though (you mean in the roasting pan, right?). I just made a roast chicken last night! Believe it or not, roast chicken is my go to for busy weeks. I can cook it ahead of time & reheat, (ala grocery store rotisserie). The roast carcass makes the best chicken noodle soup in the world. I just put the carcass in a pot of water, and add carrots, mushrooms, onions, garlic, potatoes, celery, and egg noodles. 1 chicken, 3 dinners. I don’t mind paying $10 for the free range chicken when I know I can get 3 meals out if it. Right? I love putting lemon slices and rosemary twigs under the skin on each side of the breasts. It makes for such a beautiful presentation at the table, all toasted brown skin with thatalready don garnish. I’m like you, Jody, it’s my “go-to” and I like to do one at least every other week, if not every week. Left overs may include a chicken meat casserole of some type, chicken burritos, chicken pocket sandwiches, and I double boil my chicken bones. The first time is the “stock” to put up, then do it all over again with fresh onion, carrot, celery and garlic to make that weeks soup. The soup lasts the week. spoon into the cressant roll squares, fold into triangles, seal sides. I love that you double boil your bones – I’ve done that too, depending on the quality of my chicken, and it works great! I’ve taken a liking to brushing the skin with bacon grease (when we have it) before the sea salt and herbs, so good. I am always so excited at how far I can stretch a chicken. We joined with friends to raise all our own meat last year so now I have a bunch of chicken feet to add to the broth for flavour and more nutrition. Now, if I could only remember them every time I cook a chicken;). Love all your side suggestions too! Intriguing idea, Marissa! Does it give a bacon-y flavour? Or just make it crispier? I always purchase organic chicken nowadays. The taste is better, and the broth is heavenly. At $10 a chicken, I am able to stretch that out into 10 bowls of chicken soup, 10 servings of chicken salad, and at least 10 servings of broth. Agreed! Nothing is easier than a roasted chicken! With a freezer full of our home-grown chickens, it appears weekly on the menu! I always make and freeze the broth for another simple dinner. And the leftover meat gets used for lunches for hubby and the kids lunches. Hi Joyce! Yes, lots of people make it in the crock pot – no problem! I make mine on the stove top, but I think either way is fine. I personally don’t get all the chicken off the bones first. I leave it on, then when the stock is finished simmering, I pick every little last bit of meat out and reserve it before discarding the bones. I then use the little meat bits and some of the broth to make a chicken soup (and add whatever other ingredients you want). I really like to cook and this one is really amazing. Will definitely try this, perfect for the whole family. I love roast chicken. It’s super easy and so simple, but so many people think it’s a huge deal and so complicated. Not so! I am curious about your roasting times. Do you let your chicken come to room temp before putting it into the oven? This makes a huge difference in the cooking time, plus it’s a good rule of thumb for meat in general. Also, I was wondering about the temperatures you listed. The USDA has revised their guidelines for internal chicken temps (170 at leg and thigh, 165 in breast). The organic and free range birds can still appear a little pink, even when fully cooked, so this can throw someone off if they’re not accustomed to them. Anyway, love your site!